An Equation For Everyday Life - What Are The Chances I Will Spill My Pizza? I bought a pizza for the office today. Don't get all excited and start thinking I am some aging hipster commie pinko, I am not. I am just smart enough to make sure that in return for people enduring my jokes I make sure they periodically get fed. It's not like they can buy food with what I pay them. Just bought pizza for the office. 74% of the time I get pizza on my shirt at an average 1:45 time. Anyone willing to bet an over-under? The propensity for food to magnetically be attracted to and get on my shirt is directly proportional to the contrast in color and value between my shirt and the food in question. It is a physical law more predictable than general relativity. Obviously he was joking ... a little. But jokes are funny because they parallel real life and there probably was something to the idea that you are more likely to have an accident if you're wearing clothes that would make it more noticeable. Of course, it could also be a simple psychology issue where you are instead more likely to just remember the expensive mistakes. There's only one way to find out. Unfortunately this is one instance where science cannot help. I can't buy pizza every day for enough people to get a 95% confidence interval so I had to rely on something that requires no evidence and less than 15 minutes of time to get an official sounding answer - math. Br = Brightness of the shirt, on a scale. 1 being clothes the color of mulch that you wear after 5 years of marriage and 5 being the bright yellow shirt I am wearing today. Dx = How accident prone you are, on a scale. 1 being every cop with a cup of coffee in every movie that has a cop and a remotely comedic plotline and 10 being that Sully guy who landed an airplane in the Hudson river without spilling his drink. Pa = Pattern. Does the shirt have a fancy pattern on it or is it really expensive? 1 for yes, 0 for no. Re = Are you eating in a recliner? 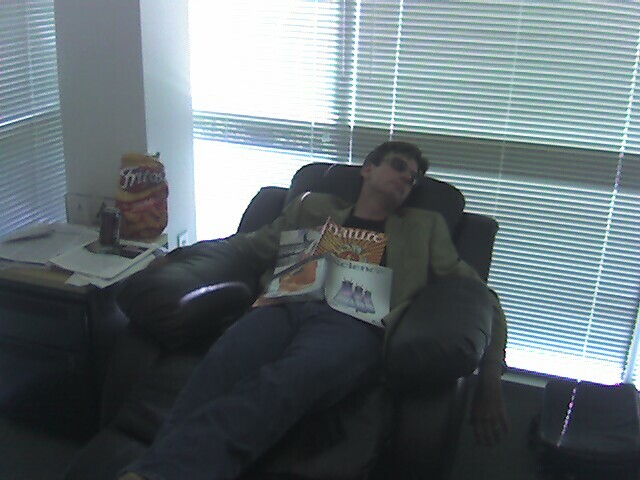 I have one in my office because it's where I do my most serious work, like napping after pizza. 1 for yes, 0 for no. Pe = Pepperoni. 1 for yes, 0 for no. Sa = Sausage. 1 for yes, 0 for no. Piz = number of slices you will have eaten, inclusive. If Sp >1, you shouldn't eat the pizza. My score ... a Brightness 5 with a Dexterity 7, a Pattern, a Recliner, Pepperoni on the pizza and 2 slices means I got a .93 today, so I should be okay.